A big congratulations to Ben Heacock on successfully defending his Ph.D. dissertation on “Neutron Dynamical Diffraction: Interferometer Improvement and Precision Structure Factor Measurements”! Researchers in Dr. Young’s group have successfully measured the lifetime of the neutron in a magnetic trap. Their results were published recently in Science. This unique method allowed them to store neutrons to measure their lifetime while removing any complications from them interacting with the walls of the trap. The necessary corrections using this method are thus smaller than the uncertainties in the measurement, in contrast to previous trap measurements of the neutron lifetime. Ultra Cold Neutron sources are based on solid deuterium (sD2) at temperatures around 5 K. Under pulsed neutron production, an appreciable decrease in neutron intensities has observed, which affects their efficiency for fundamental interaction physics experiments. Two of the leading UCN sources at PSI and LANL joined forces with the NC State University nuclear physics group to understand this UCN intensity decrease. The study shows that the decrease can be completely explained by the build-up of frost on the sD2 surface during operation. Pulsed proton beams hitting the spallation targets generate heat pulses causing cycles of D2 sublimation and subsequent resublimation on the sD2 surface. Even very small frost flakes can act as total reflectors for UCN and cause an intensity decrease. This paper was selected as a European Physics Journal Highlight! The press release can be found here. 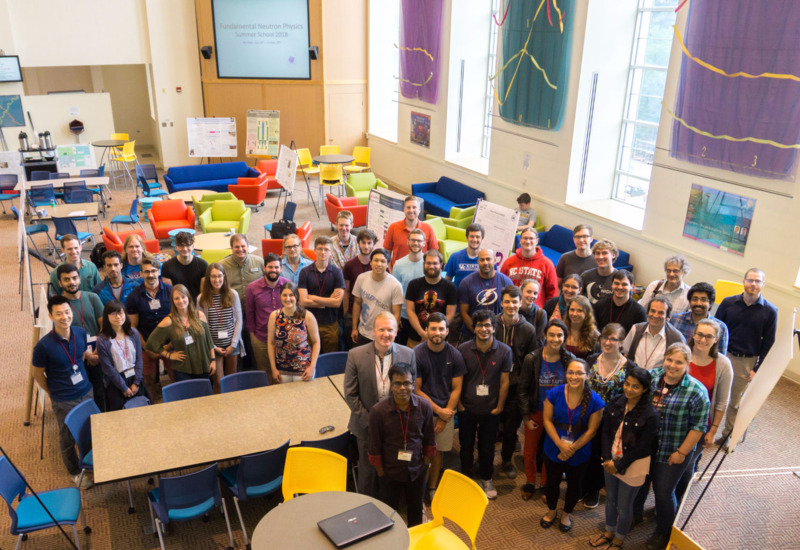 The Fundamental Neutron Physics Summer School that we hosted at NC State from July 16-20 was a resounding success! We had around 70 combined participants plus speakers, with ~11 visiting us from Europe, ~6 from Canada and 1 from Japan. The lecture program covered essential topics from top researchers on nuclear, particle, and astrophysics with low energy neutrons. 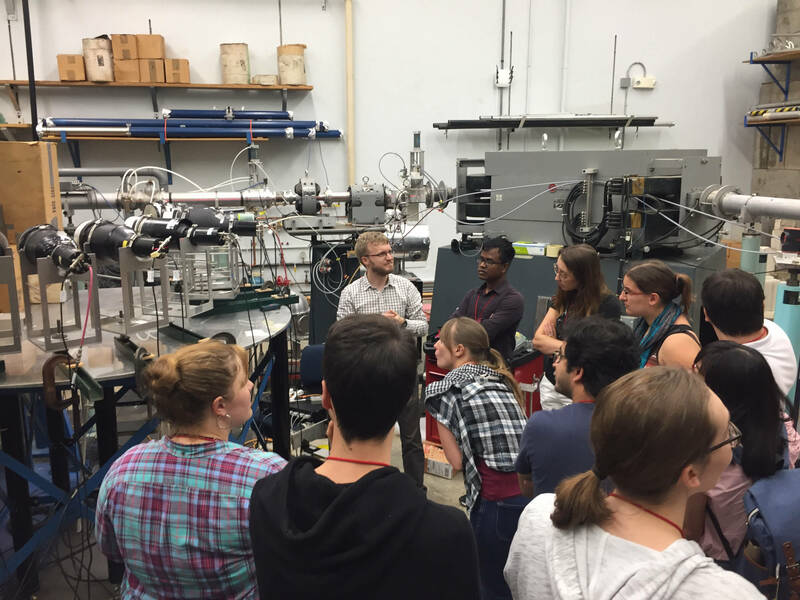 There were tours to the PULSTAR nuclear reactor on NCSU’s campus, and the 10 Mega-Volt Tandem accelerator and the Free-electron laser based High Intensity Gamma Ray source at TUNL. There was even a fun excursion to a local baseball game! Our paper exploring the current experimental information on the 39K(p,γ)40Ca reaction cross section was just accepted in Physical Review C! This reaction is critical for explaining the peculiar elemental abundance patterns in the Globular Cluster NGC 2419, which can help us understand how the galaxy evolved. We found that inconsistencies in cross section measurements make the uncertainty in this rate larger than previously assumed, thus further experimental efforts should be aimed at investigating the 39K(p,γ)40Ca cross section.